This post is sponsored by Natural Balance® Pet Foods. I am being compensated for helping spread the word about Natural Balance treats, but To Dog With Love only shares information we feel is relevant to our readers. Natural Balance is not responsible for the content of this article. 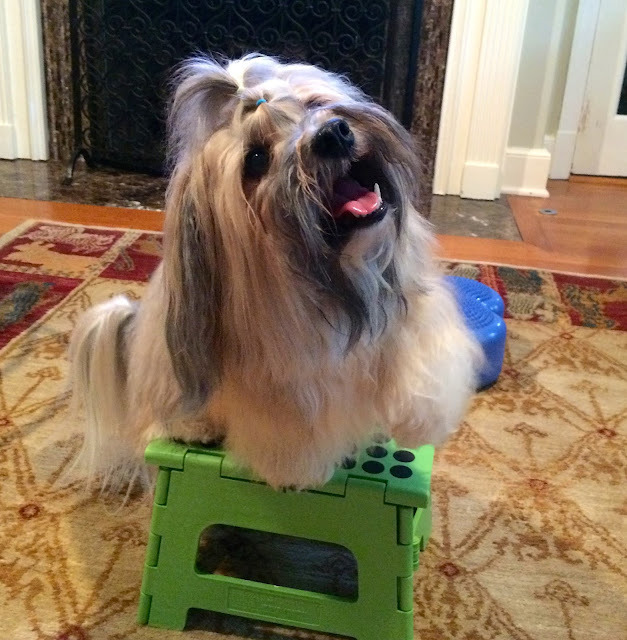 Rocco is a dog who undeniably LOVES his treats and chews. If he could fill up his shopping cart with tasty treats, you can bet it would overflow! 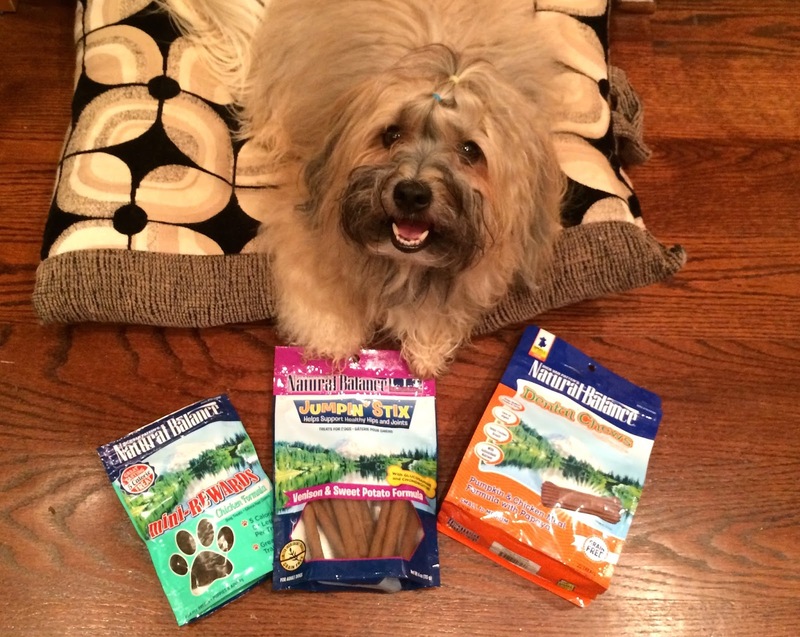 So when we heard that Natural Balance had some new tasty and nutritious treats in its lineup, Rocco couldn’t wait to try them! Rocco loves to do tricks for his treats, and since he does them A LOT, we like to use tiny treats so he can get plenty of them! Natural Balance’s Mini-Rewards seemed like a great choice for Rocco, and he couldn’t wait to get at them! Rocco waits for his Mini-Rewards... and then THIS happened! We tried the Mini-Rewards Chicken formula, made with high-quality chicken as the first ingredient. At less than five calories per treat, Rocco can do lots of tricks for lots of treats. Better yet, these treats are soft and super easy to break into even smaller pieces. I was able to break each treat into four smaller pieces for even more treat fun! 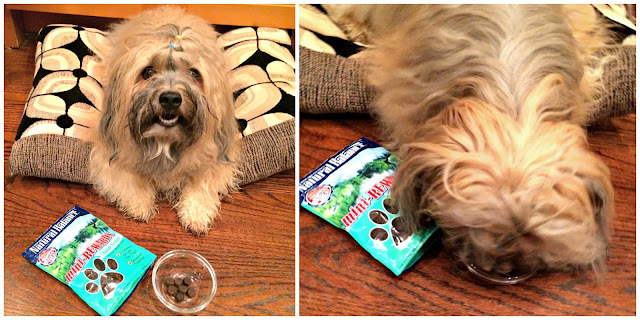 Rocco LOVES these treats, and he will do ANYTHING for them! It turns out Natural Balance has a huge selection of treats worthy of Rocco’s unique character, so Rocco was more than happy to try a few more. 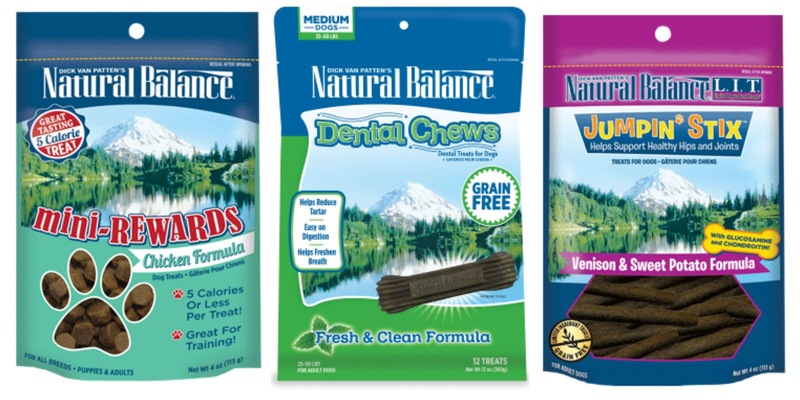 Rocco can’t live without his daily dental chew, so Natural Balance’s Dental Chews were a natural choice. These come in some tasty flavors, and the Fresh and Clean Formula is brand new! This chew is scientifically formulated to encourage your dog’s natural chewing instinct to help support healthy teeth and gums and help reduce tarter. Made with spearmint and parsley to help freshen your dog’s breath these are available in medium, small and mini sizes and single serve trials. The Natural Balance® L.I.T. Limited Ingredient Treats® also made Rocco’s shopping list. The L.I.T. Limited Ingredient Treats® Jumpin’ Stix – Venison & Sweet Potato Formula are made with Venison as the first ingredient, and they are formulated with glucosamine and chondroitin to help support healthy hips and joints. Perfect for high flying Rocco! The best thing about all of these treats is that they’re formulated with high-quality proteins, with no artificial flavors or colors and are backed with Natural Balance’s Buy with Confidence guarantee. Find Natural Balance near you using this store locator. hehe! Rocco loves what's IN his shopping cart! His shopping cart is so cute and must be so very small! Enjoy the treats! It's a small child's cart! Rocco's still a bit short for it, but it works! Thank you! 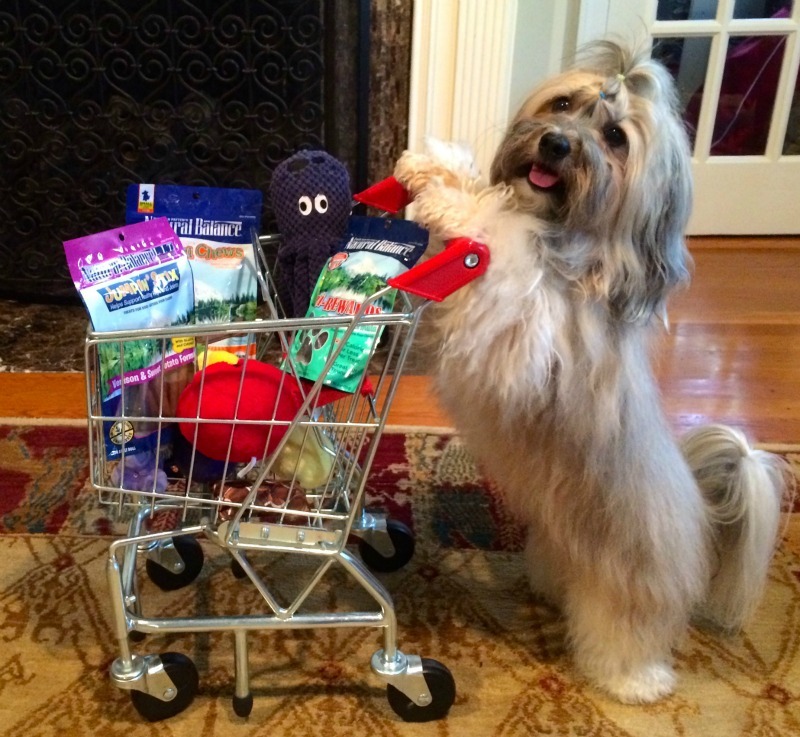 Rocco loves loading up his cart with tasty treats! ha!